I try to make my reviews as spoiler-free as possible, but there is an aspect to this game that can’t be ignored, yet I don’t want to spoil. For that reason, I’ll include the spoilery parts under a “read more” link for those who aren’t aware of what P.T. really is. All screenshots were taken by me using the Playstation 4’s share feature. Last week, at Sony’s Gamescom conference, they debuted a trailer for a new horror game called P.T. 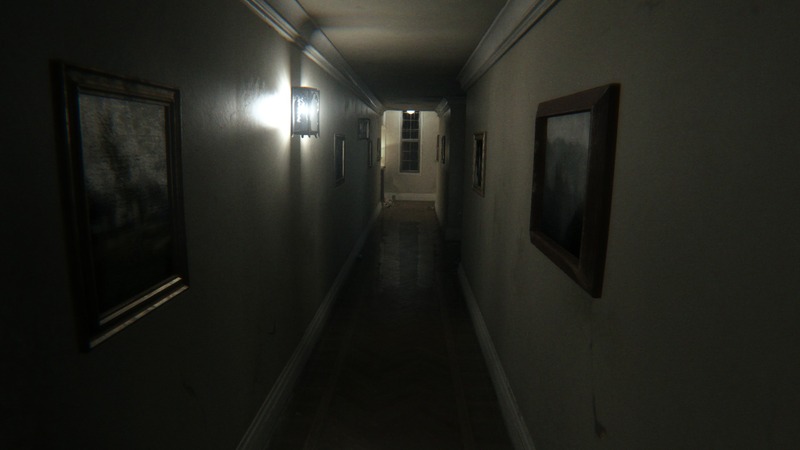 The playable demo for P.T. launched immediately after, available for download on the Playstation 4 store. As it turns out, P.T. was harboring a huge secret that only took the internet about an hour to figure out, after which news broke everywhere. 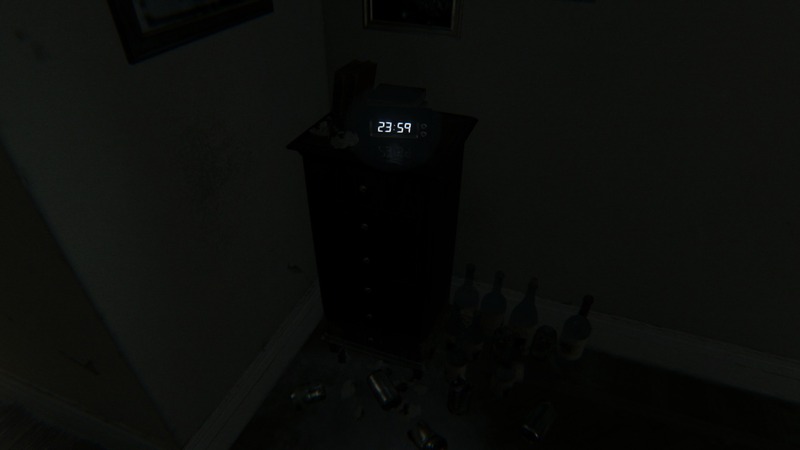 I went into P.T. after reading the headlines, so I knew what I was working toward. I did not, however, have any idea what I’d be working through. 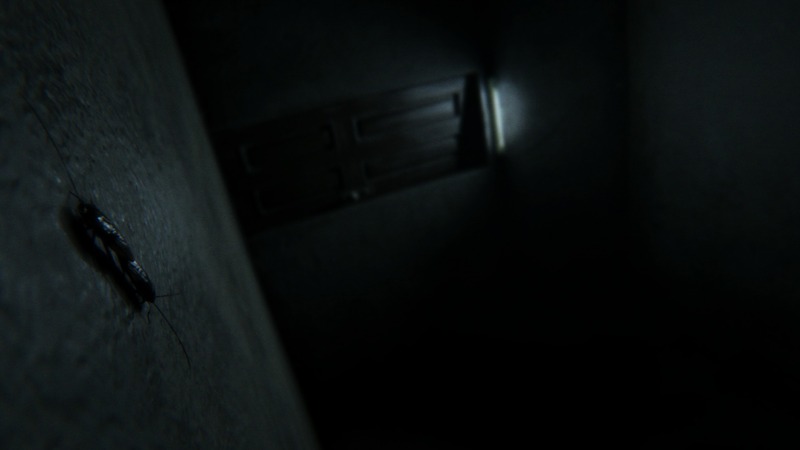 The opening shot of P.T. P.T. is a horror game. You’ve probably seen my thoughts on the horror genre in video games on this blog before (if not, I touch on them in my Outlast review here). In short, all of the horror classics have either gone on hiatus, or have shifted genres until they’re not really horror games anymore. Many indie games have come forward to fill the gap, but a lot of them are too short for their own good (and let’s be honest, a lot of them are also ripoffs of Slender). P.T. pays homage to recent works of indie horror. Played from a first-person perspective, you wake up in a grungy basement, complete with cokcroaches. The basement has only one exit, so you take it, and find yourself in a hallway. Immediately noticeable are the game’s stunning graphics. While the anti-aliasing is almost nonexistent and screen tearing is present at times, the lighting sets the mood. Things are perfectly reflected in the hallway’s polished floor, the lights bounce shadows down the hall as they would in real life. It looks like a real hallway. The first hallway you find yourself in. It won’t be the last time you see it. Walking down the hallway reveals a messy house. Food and empty beer cans litter the floors and counters, cockroaches scurry across all surfaces. Rain hits the windows from outside, a rusty hanging light groans as it swings back and forth in the foyer. There’s a radio near the front door that blasts a news report about a father who snapped and killed his family. He’s the latest in a rash of similar events. The report is staticky but audible. When it’s done, you try the front door and the hall door. Both are locked. There’s one more door, down a set of stairs, leading to the basement. Yes, the basement you just came from. So you try that door. You swing it open, and beyond you find the same dirty hallway, the same lights and cockroaches and rain. It’s a sight you’ll want to get used to, because every trip through that door leads back into the same hallway. From here, the ambiance takes over. Musical cues and sound effects become just as important as the lighting. Playing with headphones is a must, and this hallway comes to life. P.T. conjures echoes of that, with people on the internet swearing by certain events that produce no results for others who try them. The psychological creepiness of this game extends far beyond the game itself. There’s another aspect to the horror of this game. It doesn’t take many trips through the ever-looping hallway before your character begins to be followed, and then directly haunted by an ethereal being. This creature will persist through the rest of the demo, and can get you at any time. Sometimes she’s harmless, other times she kills you, sending you back to the basement (but with all of your progress intact). Oh, and don’t make the mistake of feeling safe on the pause screen. When this clock strikes midnight, all bets are off. Atmosphere is the main source of scares in P.T., which is exactly what the horror genre needs. It can be frightening to see a horde of creatures approaching you, it can impose a sense of impending doom that makes you sweat as you try to off the nearest ones or simply run away successfully, but I think it’s more frightening if a game manages to give you that sense of impending doom without any visible cues at all. “Something’s going to get me pretty soon” is always trumped by “Something’s going to get me and I have no idea what, how, or when.” P.T.‘s essence is the latter. Keeping with its psychological undertones, P.T. is more than it seems. Beating the game unlocks a post-game trailer that reveals all. If you want to unlock it yourself (and have somehow avoided all of the news spoiling it), you should stop reading here. Otherwise, feel free to press on to the next page. 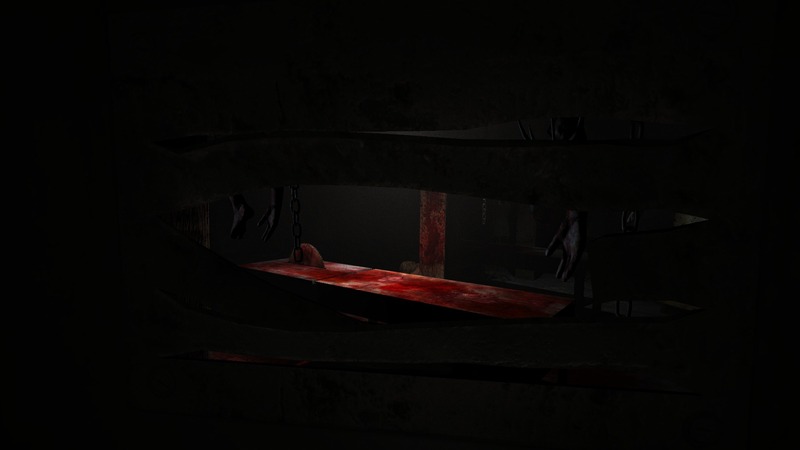 All screenshots were taken by me from the Playstation 4 version of Outlast, and may contain graphic imagery. I have a long history with the horror genre. Nearly all of the short stories I wrote as a teenager were horror stories. I loved horror films as well, and it’s no surprise that my fondness for the genre eventually extended to video games. It started with Resident Evil, as it probably should have. I bought Resident Evil and Resident Evil Zero for the GameCube, in time to play through them before the then-impending release of Resident Evil 4 (which I still consider one of the greatest video games ever made). Eventually I’d move on to other genre classics like the Silent Hill series, Dead Space, Left 4 Dead, you name it. I think the horror genre works particularly well in the world of video games. The added layer of interactivity video games provide gives you a sense of peril not possible in film or literature. It’s not impossible for a book to be frightening (I can easily refer you to House of Leaves by Mark Z. Danielewski and the short story “Vaster Than Empires and More Slow” by Ursula K. Le Guin) and you’re even more likely to find a frightening film, but video games have an innate ability to hit the fear sweet spot. I grew up on survival horror video games, but the last few years have yielded a drought for the genre. Resident Evil is more about action now (and I liked Resident Evil 5 and I liked Resident Evil 6 even more, but the horror element is barely present). Silent Hill sees few releases these days, but the series has gone more or less the same way, and while Dead Space 3 tried to strike a balance between action and horror, it mostly abandons all attempts at fear after the first third of the game. I must not be alone in my yearning for the survival horror classics of the past, because indie developers have stepped up to fill the void most major publishers seem to be ignoring. Games like Slender, Underhell, and Amnesia bring a lot to the table and prove survival horror is alive and well, but my favorite slice of this indie survival horror pie has to be Outlast. The Blair Witch Project didn’t invent the found footage genre, but it did propel it into the mainstream. A few attempts have been made to translate it into video games, but Outlast does it the best. You play as Miles Upshur, a reporter who receives an anonymous tip about atrocities being committed at Mount Massive Asylum. Armed only with his video camera, Miles breaks into the asylum. The video camera plays an integral role in Outlast, being Miles’s only ally within the walls of Mount Massive. The anonymous tipster wasn’t joking, and Miles immediately becomes trapped in Mount Massive, wandering the dark and bloodied hallways, using the camera’s night vision mode to navigate dark corridors and sneak around pursuing enemies. Night vision isn’t unlimited, and Miles must keep a stock of batteries to power it as he tries to record the events unfolding in the asylum, or just find a way out. A few survival horror games put you in the role of a defenseless protagonist, relying on stealth and running away rather than confronting enemies head-on. Outlast is interesting in that not everyone in the asylum is trying to kill you–some of the inmates will actually aid you, some will ignore you, and some will aid, ignore, or attack you depending on their mood. 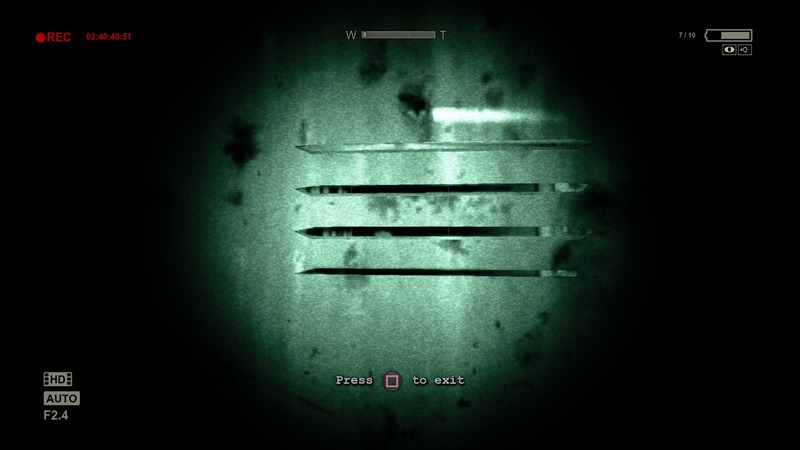 Outlast features no playable combat, forcing you to rely on stealth and hiding to avoid enemies. There are no ghosts or monsters in Mount Massive, only mentally disturbed people. While some have an inherent propensity for violence, others only mistake Miles for another “doctor” arriving to further torment them. This human aspect permeates the game, and even extends to Outlast’s primary antagonist, Chris Walker. Walker is an ex-marine committed to the asylum long before Miles’s arrival. Easily the largest inmate, Chris stalks the halls grunting about completing his mission, rattling his chains, breaking down doors, and occasionally ripping off people’s heads. He has a particular interest in Miles Upshur, and if he catches you with low enough health, it’s an immediate game over. Protagonist Miles Upshur tries in vain to defend himself against Chris Walker. Other characters (like Father Martin, Doctor Trager, and the twins) give the game a sense of personality. They’re well-written, oddly charming, and create lingering presences that keep you on your toes throughout your stay at Mount Massive. The story behind the events at the asylum unfold through documents and in-game dialogue and graffiti, all pointing Miles toward one thing: The Walrider. I won’t spoil what the Walrider is, other than it’s the one inhuman thing in Mount Massive, and Miles will eventually come face-to-face with it. A lot of the game’s events are scripted, and the layout and level design are genius. While you’re rarely not in control of the protagonist, the building is designed to make sure you’re looking at the right places at the right times to see exactly what you need to to progress the story, or just to frighten you. Outlast had me on the edge of my seat, but the game’s ending left a lot to be desired. My largest gripe with the horror genre is the way many works end. Often they’re predictable, ambiguously grim, and usually avoidable scenarios that feel more like the writing team checked out early than actually sat down to wrap up the story they created. Outlast was no exception to this rule. At least, not until Whistleblower. Outlast: Whistleblower is a DLC prequel/interquel/sequel to the main game. In it you play as Waylon Park, the anonymous tipster who first alerted Miles Upshur to the events at Mount Massive. 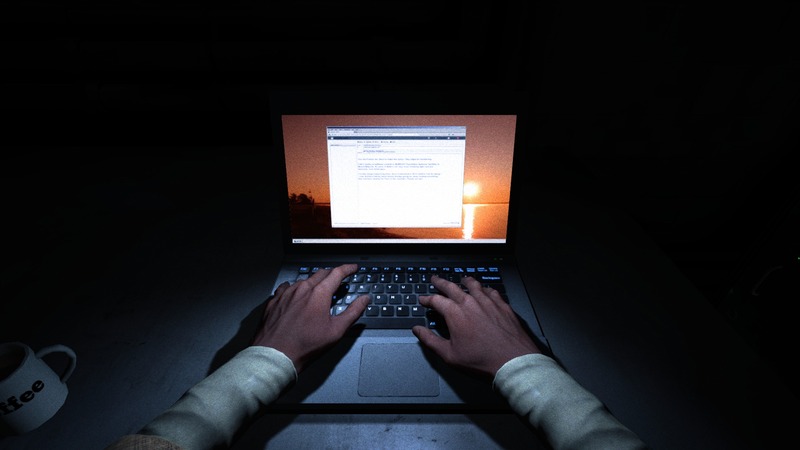 The two stories heavily intertwine, which is apparent from the beginning: Your first objective as Waylon Park is to send the email Miles Upshur receives in the main game. 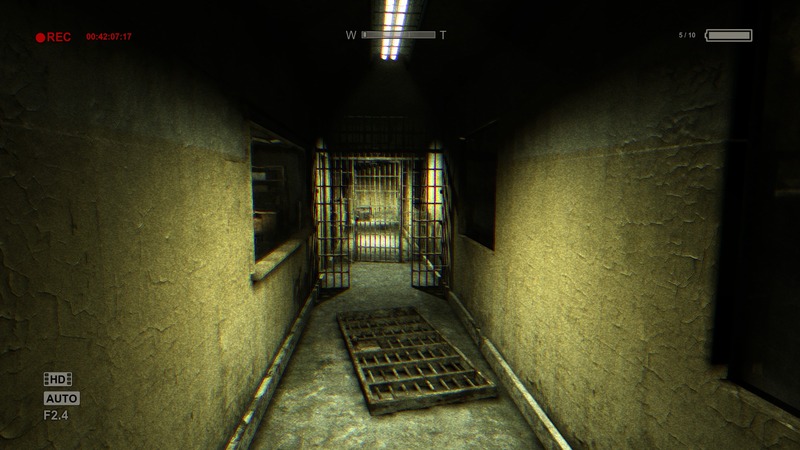 While it starts earlier than Outlast, Whistleblower is meant to be played after. As Waylon Park, you’ll experience echoes of Miles Upshur’s actions throughout the game, which leads to several Easter eggs and clever encounters with old enemies and allies. Waylon Park prepares to send an email that will change his life—and Miles Upshur’s—forever. Whistleblower doesn’t rely entirely on the old, however. The DLC introduces new characters equally as creative and frightening as the ones found in Outlast. Dennis, Frank Manera, and Eddie Gluskin almost make you wish you were being hunted by the twins or Doctor Trager again. 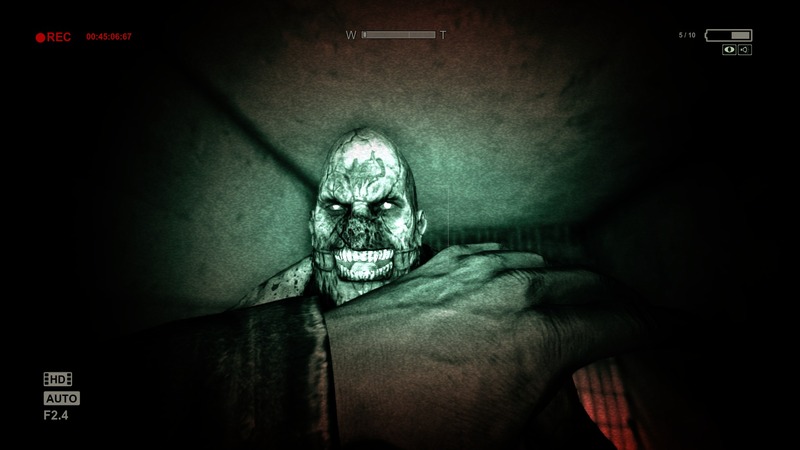 Outlast and Whisteblower touch on the “body horror” subgenre made popular by works such as Alien, The Thing, and Dead Space. As far as subgenres go, body horror is one of my favorites. When you can all but feel what’s happening on the screen, the horror becomes more visceral, more effective. Again, I don’t want to ruin the fun, but neither Miles Upshur nor Waylon Park will emerge from their time at Mount Massive entirely intact. Inmate Eddie Gluskin’s operating table. Whistleblower is a much shorter experience than Outlast (my first playthrough of the main game took almost seven hours, while Whistleblower hovered around two) but it remedies all of my qualms with the game’s ending. Both Outlast and Whistleblower come with a layer of social commentary (the former on mental health and treatment of those suffering from disorders, the latter on the titular concept of whistleblowing) but it never gets in the way of the game’s main intention: Telling a story. A very disturbing, frightening, and totally fun story. The team at Red Barrels consists mostly of former employees of Ubisoft and Naughty Dog, and proves that a game doesn’t need a huge budget or a large studio to be as good as the $60 discs you’ll find on store shelves. Outlast is a lot of fun and one of the best survival horror experiences I’m aware of. I’m excited to see what else the studio has to offer, not to mention any future entries they might have in the Outlast vein. The halls of Mount Massive are difficult to escape, but I can’t help but hope Red Barrels will one day let us back in.